Until now, it was a work in progress. That's an awesome collection. Congratulations. Thanks guys. My intent was to turn a chore (shaving) into something I truly looked forward to each morning. When deciding on the razor that I will use, I feel blessed to have the good fortune to possess these precise instruments. Nice rotation. I have added a few favorite razors recently and morning shave even more enjoyable. - fixed sequence or do you decide in the morning. (07-04-2017, 07:21 AM)SCOV Wrote: Nice rotation. I have added a few favorite razors recently and morning shave even more enjoyable. The short bases are all Wolfmans. The two taller ones are ATT. I typically use two razors at a time. Meaning I alternate between them until I've had 3 shaves with each. I change blades after three shaves in my razors. When selecting the two razors for effectively the next six days of shaving, I pair a milder razor with a more aggressive razor. some beautiful equipment here. interesting way to rotate through. I seem to forget the change my damn blades even though i probably have 1000 total. now added the gem blades to the stash. (07-04-2017, 03:40 PM)daveinsweethome Wrote: some beautiful equipment here. interesting way to rotate through. I seem to forget the change my damn blades even though i probably have 1000 total. now added the gem blades to the stash. Thanks. I use the back of a business card where each razor is listed. A hash mark each time I use one to shave with and when I get to three hash marks for a razor then it is time to change blades. When you're old, you need reminders. Stunning set up. All top shelf. I don't use a DE/SE much any more but love your setup !!! Very nice rotation. Have you tried timeless? (07-04-2017, 06:14 AM)Never2Close Wrote: My intent was to turn a chore (shaving) into something I truly looked forward to each morning. Feel the same. 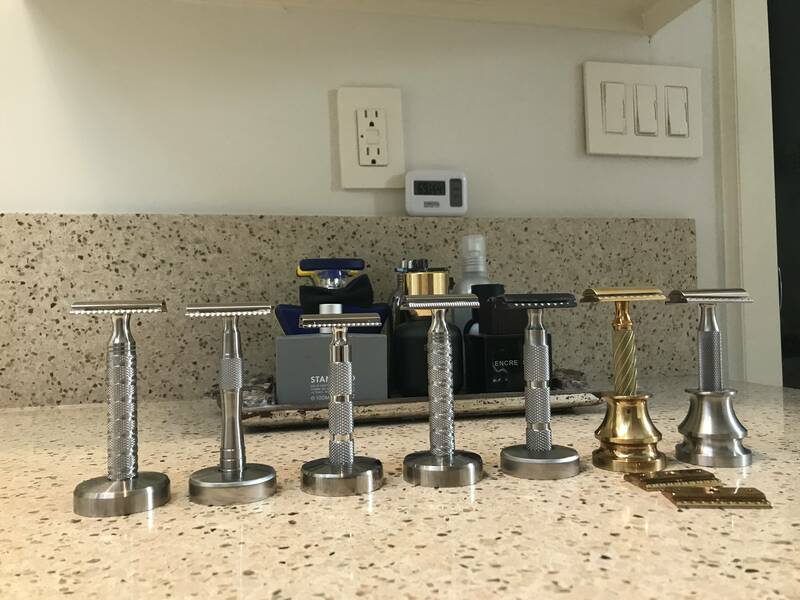 Razor rotation: ATT R2, Timeless .95 sb, Oristo, Ikon B1 Standard. Also, about seven brushes. A similar number of soaps and creams. And a similar number of aftershaves. These are beautiful razors. Agreed that a fine tool makes the job more enjoyable. I’m currently waiting for the gem of my collection to arrive: the Tatara Masamune.